The Avocent ACS6008SDC is an 8-port ACS 6000 console server with single DC power supply . The ACS 6000 series of advanced console servers integrates cutting edge technologies, adaptive services and secure enterprise communications. They offer IT professionals and network operations center (NOC) personnel the ability to perform secure, remote data center management and out-of-band management of IT assets from anywhere in the world. Using a hardened Linux operating system, ACS 6000 console servers provide optimal performance, security and reliability. Using DSView 3 management software and integrated power, they provide a complete out-of-band management solution. 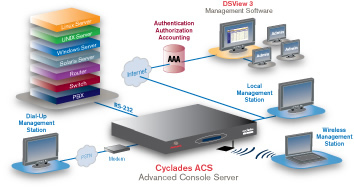 The ACS 6000 series provides a complete solution for secure remote control with features such as enhanced security, data logging and event monitoring. In addition, the console servers support next generation network standards such as Internet Protocol version 6 (IPv6). These console servers fit in 1U of rack space with single and dual AC or DC power options. With and without modem, the console servers help maximize IT asset productivity, provide scalability and reduce operational costs.